Businesses sometimes need to move people from one place to another. But the success of any business relies on maximizing profits while minimizing expenses. So the most cost-effective way for businesses to transport people is often through chartering buses. There are short-term and long-term reasons why businesses should consider bus charters. Short-term charters would include things like one-time corporate outings, transporting groups to and from the airport, and arranging for tours of facilities or properties. Long-term leases could include things like providing buses to transport employees and visitors from remote parking areas and providing regular transportation to and from distant locations. School districts, local governments, and other public entities often lease buses rather than purchasing them outright in order to minimize costs while providing necessary services to their constituents. Plus, bus charters typically include trained professional drivers, minimizing labor costs for businesses and organizations. Charter bus rental is often the most cost-effective way to go for businesses, organizations, and public entities. The biggest cost benefit of chartering buses is that you don’t have to purchase and maintain costly tour buses. Instead, businesses can simply lease them for either short-term trips or long-term needs and use them only when they need them. That allows businesses to minimize their expense by only chartering buses for specific purposes, rather than buying buses outright and having them sit idle while they are not in use. Whether your business needs a short-term charter or a long-term lease, you can find the luxury motor coaches you need at FloridaTours.com. We specialize in providing businesses in South Florida with the finest, most comfortable, and most affordable charter buses available. 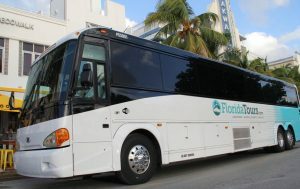 When you need a bus charter, make your first choice FloridaTours.com.